It’s a set of 2 Doctor Who drinking glasses! Doctor Who is all about travelling through time and space, but the show isn’t without its fair share of transformation. Putting the doc aside, the Weeping Angels transform from statues to very fast, very alive monsters in the blink of an eye. The TARDIS transformed into a Police Box (once). So, it makes sense that this set of 2 Doctor Who glasses would transform as well! 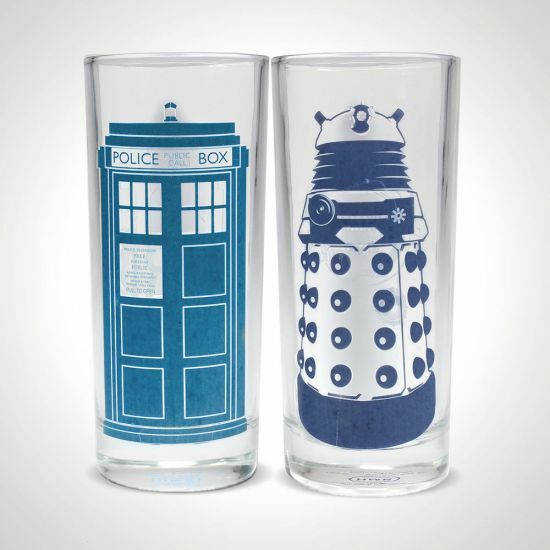 Featuring a spaceship stuck in chameleon mode and one of the greatest metalheads of all time, these glasses have images of the TARDIS and a Dalek printed on them in white. On their backs they have some classic phrases – ‘Time Lord’ for the TARDIS and ‘Exterminate! Disintegrate!’ for the Dalek. But, similar to the way the Doctor regenerates, these glasses take on new life when you fill them with cold liquid, transforming their images and writing from white to shades of blue! These glasses come in a set of 2, because the Doctor should never travel alone. And, much like the TARDIS, they’re a lot more spacious than you might think, holding a whopping 300 ml each! So, to watch these classic Dr Who images appear on your drinking glasses as your favourite show appears on your telly, order this 2-pack of Doctor Who TARDIS and Dalek cold change glasses today!